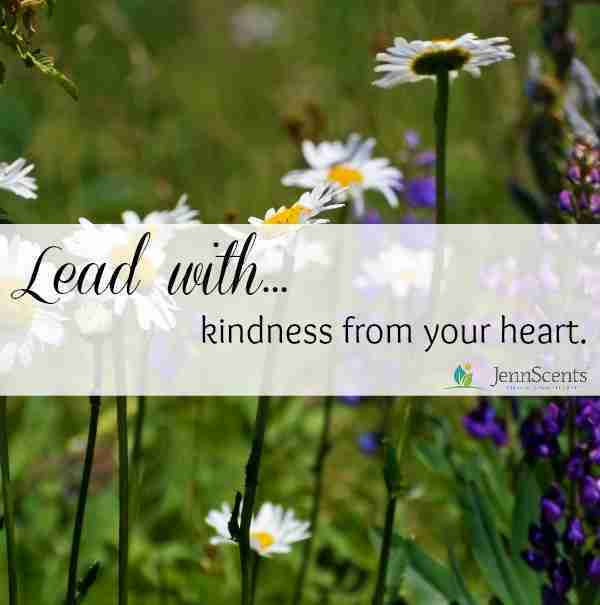 Lead with Kindness from Your Heart - JennScents, Inc. In a world that likes to focus on the negatives and what is not right, we have to find time and the space to nurture loving, kind, non-judgmental thoughts. We have to give thanks to the blessings we do have, and what is right in our lives. As the old saying goes, “you are what you attract.” If you are negative, your will attract more negativity, which feeds your negativity and makes it worse. It is easy to get caught up in this spiral effect. It is a known fact that negative emotions and thoughts suppress the immune system and inhibits cells to work at their best at a cellular and organ level. Do you find that you are sick a lot? Or often don’t feel well? If so, do am emotional check to see if you are surrounded by negativity or positivity. If you surround yourself by positive, happy, productive people, and create that optimistic environment, you can’t help but to have a smile on your face (and in your heart). You think more clearly, with a positive outcome in mind rather than nay-saying. You know “you can” do something rather than count the ways you “can’t”. Find positive people in your community and surround yourself with their presence, even if it is on facebook. Create a “positive day” or “positive affirmation” board on Pinterest and read those affirmation throughout the day. Share them with friends and find new ones to inspire you. Man people focus on the interior design of their homes, but forget to give attention to our “internal interior design”. Your liver (the organ that holds anger) may want a new couch or flower bouquet, your intestines (the organ that holds the emotional of worry) may need a fresh coat of paint, and your lungs (the organ that holds the emotion of grief) may need some decluttering and fresh décor. Think about it, YOU are the common denominator in all events that happen in your life. YOU need to be whole. It’s like in accounting, your pluses and minuses need to balance. If you take out a withdrawal of energy, you need to replace it. It’s called self-care. Nothing selfish or guilty about it. Just a fact. Wake up, look in the mirror (even with those blurry eyes) and thank yourself for showing up today. Say “I love you self” and “we are going to make a difference today”. At lunch, honor yourself for being productive. Recite a positive affirmation that keeps you centered and focused on being positive, and to help you combat any negative energy that might be flowing your way. At dinner, recount your blessings for the day. What good things happened? What lessons did you learn? How can you pay those blessings forward? At bed, say your prayers for all of those in need, that they too can have some positive sunlight in their day.